I put him as my MOTM thought he was really good today. Was between him and Fred. Noticed last few games he has been really aggressive winning the ball back much higher and taking no prisoners. Also striding forward with the ball at times and that pass to Rashford... midfield take note. Not the first time this season he has played a defence splitting pass either. Every single season whenever he regains manager's trust he is afraid to rest him even in weaker games, and it's happening again under Ole. It's incredible that we couldn't rest him today after playing so much football since he came back into the team. It was the case under van Gaal and Mourinho too, once he got their trust he was literally starting every game. It's Smalling plus one. He will partner whoever United purchase this summer to bolster our defense. He's done it a couple of other times since Ole's been in the job. Usually in a situation like today where no options are open. Which is a bit strange, as we saw how well United played without him during his latest injury. He needs a haircut. He's a very good defender. If so God help us. We'll never win the title with Chris Smalling as a starting CB. But we did in 2013. Always seems a ridiculous comment when people post this stuff, when he's our best CB. If that turns out to be true then its still the case for the rest of our CBs too. Did we? Considering Chris Smalling made 15 apps total in the league in 12/13 with many of those at RB. Is that what you consider a 'starting CB'? The problem with Smalling, is if he gets anywhere near the half way line, he starts panicking, gets a nose bleed, and needs the next 20 minutes of the match to calm himself down. You see it at OT all the time, if he has a chance of a 'useful' pass forward, but this pass requires anything other than a basic pass, he will pass it backwards, or sideways, fearing his own heart rate if he tries anything other than what he knows - a very basic level of football. Ekeke below ... I was there pal, and seen it with my own eyes, just like I have for over a decade, you know, in the flesh, not from a feed. You see it at OT all the the time, if he has a chance of a 'useful' pass forward, but this pass requires anything but absolute 100% certainty, he will pass it backwards, or sideways, fearing his own heart rate if he tries anything other than what he knows - a very basic level of football. He did take it forward once against West Ham but you can tell he's not comfortable being there. He wasn't helped by absolutely zero movement. Lingard stood still on his left, Lukaku (i think) not moving to his right. He looks uncomfortable but it actually shows confidence to step out when he sees an opportunity and to put in that pass shows ability as well. Even if it is forced by lack of movement and not in his natural game it is very good to see a player that knows his limitations also has the confidence to try and do the right thing. He is very likeable, imo. He has the occasional good offensive play in him, always has. You could make a very nice complication video from all his runs and forward passes and it would change the mind of a lot of football fans, at least those who I think just never noticed stuff like that. Qualities underrated, weaknesses overstated. It's good he's doing it but ultimately being good on the ball isn't just about being able to bring it up into open space or play a good forward pass once or twice a game. It's good for his stats and Youtube videos but it's pretty irrelevant overall. The England setup see that and it looks like our own coaches do too by how we set the defence up with him vs. without him. You are free to elaborate if you want too. How do we set up differently with vs without him, and what is it that players like Jones, Bailly, Rojo and Lindelof brings to the table that Chris is unable to do in that specific setup? Then you missed Smalling running the ball into midfield twice, including 1 key pass to set up a chance. Its not normally his strength but he did it well in our most recent match, so your timing is ridiculous. It's the hesitancy in his passing. It allows the opposition to get 20 yards up the field every time and forces our own players back. Either our own midfield drops to pick the ball up or we zig zag our way back to De Gea, but it leaves us facing our own goal and on the back foot. Top teams can't play that way, you have to maintain a higher tempo and keep pressure further up the field. In the period he was out our midfield was staying higher and pressuring our opponents further up the pitch. I think it was Herrera who even said that was what we were trying to do at that time. 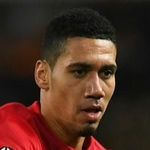 We're not exactly blessed with top class defenders but Smalling is easily the worst at it. It's good he's doing it but ultimately being good on the ball isn't just about being able to bring it up into open space or play a good forward pass once or twice a game. It's good for his stats and Youtube videos but it's pretty irrelevant overall. The England setup see that and it looks like our own coaches do too by how we set the defence up with him vs. without him. Maybe United played in a bit different way when Smalling was injured, but you mean the defensive set up was different? In what way? See the above reply. We were pressing higher up the pitch and the transition from defence to attack was faster. I doubt it's all down to Smalling but its next to impossible to play like that with defenders who are uncomfortable on the ball, and every successful team in 2019 plays that way. Ok, but do you think that it was the tactics decided by the manager? Ok, today Smalling isnt playing, let’s press high and make fast transitions. Or that they play with the same tactics but different results? Just marked out Messi the GOAT, and Suarez a bit, then performed well in the last game. But still a few couldn't resist taking a dig at him. I wonder if that's an irrational thinking, don't have clue about CB, or just pure ego that they are wrong. How should I know? I'd like to think the instruction is always to press high and make fast transitions because that's how all the best teams play. Maybe Solskjaer doesn't feel we have the players to do it so is happy for us sit off teams for now. Whatever it is, we certainly don't do it the way we did when he first took over. This isn't necessarily directed at Smalling but i keep seeing this posted. Are people forgetting Messi actually cut us apart and created a goal in a home game that we lost? It was hardly a masterclass. Injuries after that initial period might have something to do with it and I suspect if you look at stats you'll find we run less now than we did in that period, which would make sense. I'm not sure our midfield has been the same either and most of our attacking players, especially Lingard has lost his way since then. It is a lot of aspects that automatically gets ignored by your reasoning for speculating on Smalling's ability on the ball and its effect on the teams tactical approach. I think having a coherent team plays a bigger part in your concerns than just one individual player looking uncomfortable. We started picking up a ridiculous amount of muscle injuries after that initial period. It makes sense that injuries would happen after such a drastic change, and it also makes sense that we'd then reduce that change in the short-term as our players adjust to it. Because Smalling can't be everywhere, and Messi easily got away from Shaw and Lindelof. It was the same against Juve, but we defended Lindelof because he was up against Ronaldo. If Lindelof was even half as good as Smalling, I reckon we would have a much better defence. Did you see that assist? It was an absolute no-look worldy. Vidic and Rio would've had a hard time stopping that pass. To be honest it was a great run by the Barcelona players where Lindelof had to follow Messi and Suarez ran in different direction with Smalling ending up in a position in between. The nice moves plus some luck created that (own) goal. Overall I think both Lindelof and Smalling did well in that match. We have seen many great defenders being fooled by Messi's run. Who doesn't remember when he totally fooled Ferdinand in the CL final ten years ago? Couldn't do it when up against Smalling though which is the point. The move wasn't that amazing imo, it was all Shaw for that one. What's frustrating is he saw Suarez and still decided to not do anything. Watch the replay Shaw actually turns and takes a look (maybe even 2) but still decides to give Suarez all the space. Rojo actually did the same for West hams goal on Saturday. I understand that is your point. Too bad your super hero wasn't around when needed. Who, Smalling? Obviously it was not his job to defend in either situations. Opposition players always seem to engage Lindelof since they are rarely able to get the better of Smalling. Yes it was strange and very passive. Maybe he thought it was more important to protect the centre. I fully agree! That's why it was too bad Smalling wasn't around holding everybody's hand when he was needed. We all all know how useless Shaw and Lindelof were when Smalling was out for his latest injury. And Shaw's own goal? Wtf? Would of course never happen to Smalling. Cant remember the last time he lost his bearings and had no idea where he was inside the box like Lindelof did. Its Shaw's mistake but Lindelof had a chance to make up for it and was found wanting too. I dont remember us playing Barcelona when Smalling was out injured. Then again I guess playing any team without your best CB feels a lot tougher. So maybe we played Barcelona many times. Agree! Smalling did not only single handedly defend against the top teams of Europe, he also had to babysit Lindelof and Shaw at the same time. Agree! Smalling did not only single handedly defended against the top teams of Europe, he also had to babysit Lindelof and Shaw at the same time. Nobody single handedly defends. No team plays with 1 defender. But all teams play with a best defender, Smalling being ours. I'm sure you can see the funny side of that statement. This is Messi we are talking about. Aside from the head incident Messi actually only went near Smalling twice all game, and both times he got his pass away. He plays much deeper these days, we had Fred, McTominay and occasionally Shaw doubling up on him in midfield. Him being quiet had nothing to do with Smalling, they were rarely in the same area of the pitch. - Talked about what it was liking finding out United wanted him, and how he met with Fergie and Hodgson in a hotel room, with SAF wanting to know about him as a person/character. - Has a picture of him meeting SAF and Bobby Charlton on his wall. - Said that Young controls the dressing room music, and if not him then Pogba... David tries, but nobody likes his heavy metal stuff. - Players do enjoy singing their own songs - admits to singing his own songs with mates, and says that Tony Martial loves his song. - Messi elbow was an accident, which Messi acknowledge after the game when Chris apologised. Says Messi is one of if not the best player ever. - Is going to be a father for the first time soon.